While by no means Bali’s most beautiful beach, Kuta Beach starts towards the south near the airport and stretches uninterrupted for kilometres. There are about a gazillion deckchairs and umbrellas along with some shaded areas. In Kuta and Legian where most people choose to hang out on the beach, beach vendors do a roaring trade selling food and drinks and renting out surfboards. Masseuses also offer their services for ridiculously low prices (30,000 rupiah/hour). Vendors can become annoyingly persistent on Kuta Beach and some find, by buying one item (say a pineapple) they get left in a little more peace. If being asked to buy a sarong every ten minutes intensely bothers you, we’d suggest choosing one of Bali’s other beaches for your down time. Aside from the vendors, the beach is also patrolled by lifeguards and it is important to take their advice and only swim between the flags erected to indicate where it is safe to swim. Outside of these flagged areas, the surf is more dangerous and is unpatrolled. Every year, tourists drown on this beach such is the treacherous nature of the current. 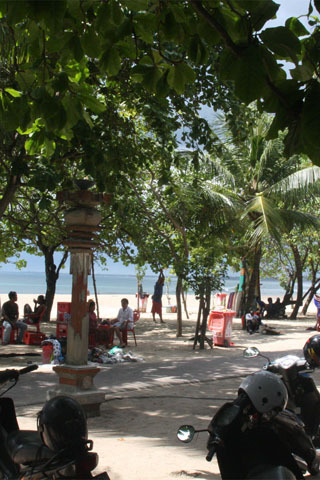 For those seeking a more a peaceful section of the beach, head south towards the Kuta art market where the beach is almost totally devoid of other tourists and the surf is less rough.